Throughout the month of January, the Pickering Library will be handing out Bingo Cards for their Family Literacy Bingo Challenge. Each family is expected to complete all the activities on the card by the 29th of January so they can be entered into a draw for a family prize package! This is the perfect way to get together with everyone and encourage your children to read, so cozy up and spend some of those cold January evenings together playing family literacy bingo! Spend your Wednesday evening laughing your winter blues away, and enjoy the talents of some of the area’s best stand up comedians at Wednesday Night Comedy offered by Live Lounge in Ajax. The weekly event runs throughout the month of January and is free to attend! 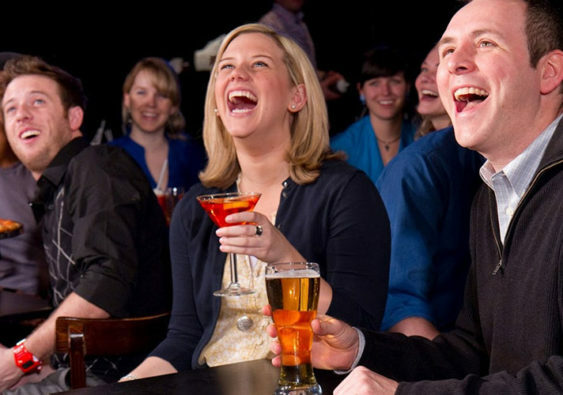 It is the perfect way to spend an evening out with your friends, enjoying a drink and some good laughs. Whether you are a seasoned skier or you are just starting out, a fun way to spend a cold January afternoon is out on the trails at the annual Ganaraska Conservation Authority’s Cross Country Ski and Snowshoe Day. The event takes place on January 26 where participants can enjoy a quick lesson, followed by a guided tour through the Ganaraska Forest on skis or snowshoes. The equipment is provided for either activity and, after the guided tour, you and your family are encouraged to explore on your own. So spend a day outside enjoying the natural beauty of the area, cross country skiing or snowshoeing through one of Durham Region’s most beautiful forests. Spend a Saturday morning trying to solve the classic mystery game of Clue, surrounded by live-action characters! On January 26 the Clarington Museum will be hosting the event, Clue With You. Attendees will be surrounded by the classic characters as they try to solve the murder of Mr. Peabody. This event is fun for all ages and tickets are only $30.00 per person! Bring your family and try to solve the mystery together! This family event is a way to celebrate the season with a fun filled day of winter-themed crafts and activities everyone can enjoy! Frozen Fiesta at the Brooklin Public Library is an exciting way to spend some quality time together and forget about your winter blues. Entry is free and the event runs from 2-4 PM. The cold weather is upon us and winter has arrived, but that doesn’t mean you have to sit inside all day! The Durham Region has a multitude of activities that are fun for everyone, and can turn your boring winter into one that you will never forget! Whether you spend time together trying to solve a mystery or you get outdoors and try cross country skiing, Durham Region has many events that are sure to please your whole family! For more ideas on events happening in Durham Region, visit the Falconcrest Homes Blog.